Recently some major changes were introduced in the overall structure of TOPIK test. Everything has been changed from the TOPIK level structure, sections of the test, number and type of questions to pass/fail scores. Here in this post I will be guiding you through every change that you need to know about. I am going to put things in very simplified and clear way. The New Changed TOPIK Format has been implemented from the 35th TOPIK, which was held in July, 2014. So you should change your preparation strategy accordingly. Changes to TOPIK Level Structure: In the old format, we had 3 levels – Beginner, Intermediate and Advanced and every level had 2 sub-levels ranging from 1 to 6. Now in the new format, we still have 6 levels but there is a slight change in the structure. 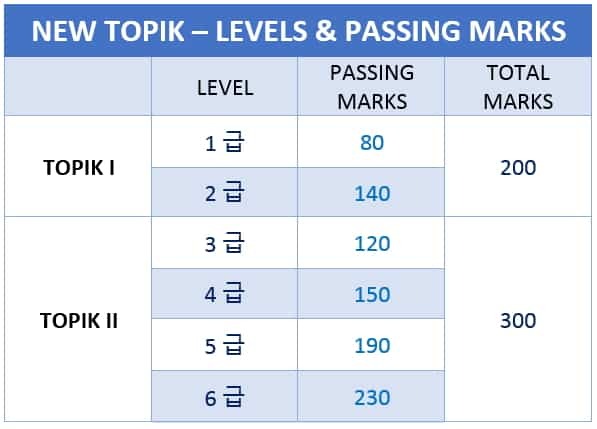 Now, instead of 3 tests we have only 2 which they call TOPIK I(Level 1-2) [한국어능력시험Ⅰ(1~2급)] & TOPIK II (Level 3-6) [한국어능력시험 Ⅱ(3~6급)]. Intermediate and Advanced Test is combined now. Changes to Sections of TOPIK test: As we know, in the old format the test had 4 sections – Grammar & Vocabulary, Writing, Listening and Reading. Now they have removed Grammar & Vocabulary, Writing from Level 1 & 2 (i.e. TOPIK I). Now the beginner levels 1 and 2 have just two sections – Reading and Listening. In TOPIK II (Level 3-6), which is the new combined Intermediate-Advanced test, they have kept 3 sections – Reading, Listening and Writing and removed Grammar & Vocabulary. So overall, we can say that the new format is more simplified. Good news, right? But for some of the test takers it’s not a good change. Grammar and Vocabulary was a section in which many people got a high score easily. For them, it’s going to make the test more difficult. The beginner level test has definitely become easier as you don’t need to write anything – just mark the multiple choice answers. But the Intermediate-Advanced level test has become much more difficult, especially for the Intermediate level test takers. The reading section has got too lengthy and in the writing section, you have to write two essays instead of one. I will write a separate post on the possible impact of the changes to topik. Let’s stick to understanding the changes in this post. Changes to Question Composition, Time and Marks: In the old format we used to have 30 Multiple Choice Questions in Grammar-Vocab, Listening and Reading sections and writing sections had 10 Multiple Choice Questions and 4-6 Short-answer/essay questions. In the new TOPIK structure, TOPIK I (Level 1-2) has a total of 70 Multiple Choice Questions – Reading (40 Questions) and Listening (30 Questions). TOPIK I has a total of 200 marks and the Test Time is 100 Minutes. TOPIK II (Level 3-6) has a total of 104 Questions – Reading (50 Multiple Choice Questions) and Listening (50 Multiple Choice Questions) and Writing (4 Short-answer/Essay Questions). TOPIK II has a total of 300 marks and the Test Time is 180 Minutes. TOPIK II (3-6) – 104 Ques.- Reading(50), Listening(50),Writing (4)- 300 Marks – 180 Min. Changes to Pass-Fail Score Rules: In the old TOPIK structure, you had to get a minimum score of 40 in all 4 sections to get levels 1, 3 or 5 and a minimum of 50 marks in all sections to get levels 2, 4 or 6. It meant if you get 70 percent marks overall but 39 in one section you get Fail. it’s really a good news that now they have removed this rule. Now they will just see your overall score and you get your level and pass/fail on the basis of total score. Low marks in any one or more individual sections will not influence your overall result (pass/fail). Change to frequency of TOPIK Test: Till 2013, TOPIK was held twice a year (April & October) overseas and 4 times a year (January, April, July & October)in Korea. Now they will hold the test 5 times in a year in Korea (January, April, July, October & November). Overseas there will be two tests in a year as before. Changes to Writing section in Intermediate-Advanced Level: Now the writing section has just 4 questions – 2 short answer questions where you have to make a sentence and two essay questions. One essay will be related to everyday life topics and will be easier to write while the other essay will be a logical one where you will have t write your opinion on some issue or something like that. The first essay will be 200-300 characters long while the second one will be 600-700 characters. How will the decide the levels? What will be the passing score for different Levels? Any Specific changes to question pattern? Will they get difficult? Yes. There has been many changes in the question patterns. As far as the difficulty level is concerned, it seems like Intermediate-Advanced level TOPIK has got more difficult while the beginner level TOPIK has been really easier. Check the Sample papers to understand the new test structure and question pattern or if you have our Guide, watch the video lectures for all the sections while refering to the sample papers and TOPIK – Self Study Guide eBook. Validity of TOPIK Certificate: 2 years. Is there any Sample Paper to understand and practice the New TOPIK Format? Yes, there is. you can download New TOPIK Sample Papers HERE. You can also take TOPIK Practice Tests online. You can also download the 35th TOPIK Test papers. Will You Recommend any Guide Book for the New Format TOPIK? We get this question a lot and it has been really difficult for us to answer because there are not many good books in market that we can recommend to you. So TOPIK GUIDE Expert team created our own TOPIK Study Package to suit our valuable readers’ needs. The study package contains everything that you need to pass new format TOPIK with high scores. Click on the image below to get more details about it. Who should I call if I have any query? (☎ 02-3668-1331 or e-mail : [email protected]) or you can ask TOPIK GUIDE through comments or on our facebook page. Check The Official TOPIK Notification about these changes. They will release the required passing marks right after the test. SO people will still be able to check the answer and guess their result. Regarding these new changes, I heard they were considering adding a Speaking section. Do you know anything about it? They were planning to add speaking section but they couldn’t. There were lots of technical hurdles. Hello..do you have audio files for the sample questions? Hello Satish, what is the use of 2 years Validity Period in TOPIK Certificate ? I’m one of the 32nd TOPIK Beginner Grade II candidates, do I need to re-seat the new format TOPIK Beginner Examination ? Actually I think, New TOPIK will be easier than the old one. Wow… thank you for posting this news. Looks like the beginner level will become easier as they omitted the writing section. I wonder what will the combined level be? Do we still have to write a composition in writing section? hi I am considering taking the advanced level for the 34th or originally 35th. Would it be better for me if I take on the 35th instead then? My uni said they needed a level 4 or 5 but now with the change I’m not so sure.. I also don’t understand the point of not fixing the passing score. May be they want to have an idea about things in the first test. Hello! When it says validity of TOPIK certificate is 2 years, what does it mean? TOPIK validity means that the certificate is valid for two years only.. after that you need to take test again..
anyway can i ask about how long it took you guys to be able to complete a TOPIK test with a passing score of level 4? Hi, sorry, not sure if this has been asked, but is there an answer sheet for the new TOPIK sample? Thank you. Try download the sample paper again. I have included the answersheets. For beginner test ..is there need to memorize all 600 vocabulary words ? intermediate/advanced level totally freaking me out..lots of difficult vocabulary..please help me.. Thank you for pointing out. Corrected it. What help do you need. 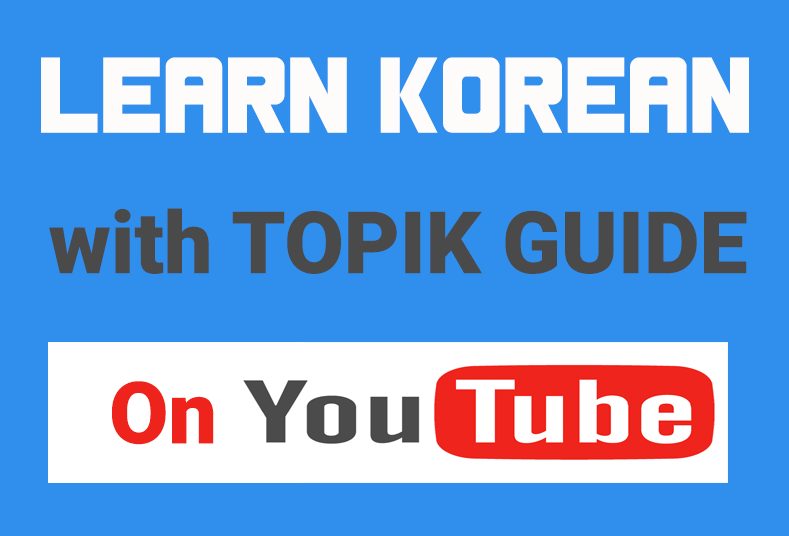 Go to topik.go.kr, make your account there, login and fill up the form. If you are able to then go to NIIED office at Hyehwa station exit 2 and they will help you. About the TOPIK GUIDE study package, you can buy it online through our site and pay with your card or bank transfer. how can order for complete topik guide (new version) without any visa or paypal card i have only korean bank card. so can u help me? I have a question, when we register to take the TOPIK, do we select what level we are testing for? Would first time-test takers need to take Beginner level? The process is very confusing, and I would be taking it on my own without the “sponsorship” so to speak of an official class as most of my Korean has been self-taught. I am hoping to go to graduate school in Korea, and it seems as though I need TOPIK level 3 to be accepted into the school and would then need level 4 or 5 to graduate. Any information would be greatly appreciated! Is there any correlation this TOPIK test with the EPS TOPIK test? In the new TOPIK format, beginner level (1-2) has also become difficult as compare to previous format. Listening was pretty easier in previous format but that is not the case in the new one. They already have speeded up the conversations and shortened the time gap between two questions, moreover difficulty level has been increased. In reading section you have to answer 70 questions in one hour instead of 60, so 10 more paragraphs to answer in a similar given amount of time. In my opinion if some one is preparing for beginner level according to the previous format structure and taking good scores in the previous format tests, then he/she should be really careful because they will find it more harder so be prepared. If we have passed level 1 in TOPIK I, then to give TOPIK II, do we have to give TOPIK I again so that we pass level 2 and then level 3 and so on? In simple words, If we score level 1, can we give TOPIK II, without scoring level 2? Can I retake the exam if I get the level that Im not satisfied? If the passing criteria is just based on total score, so I can leave (let’s say) the writing section unanswered as long as I’m sure my total score from the other sections are safe right?